← Does A Sovereign Nation Have The Right To Make Being Gay Illegal? With his decision to prorogue parliament for a record-breaking 4th time and to keep parliament from sitting while writing his throne speech, his Royal Highness Stephen Harper The First Of Canada extends vacation for his court(royal), but not to his subjects (The average working stiffs in Canada); in fact they have to work longer before being able to retire, by his royal command. This prime minister seems to think that it is only everyone else in Canada that needs to work and pull their weight and that because of the dictatorship he has imposed on Canadians. With his party winning a majority of seats in the house of commons and his having appointed enough bipartisan senators to force the senate to do his bidding, he no longer thinks that he has to show up for work, or answer to Canadians. NDP leader Thomas Mulcair pointed out that by the time parliament is scheduled to return after this prorogation the Prime Minister of Canada will have attended the House of Commons only 5 times since the spring session, that’s 5 times in the last 5 months. We are in a time in our history when both parents have to work just to keep out of debt, providing food and shelter, education and medical as well as transportation and social activities for their families. All of this leaves little time for quality family time and often no money for extras like vacations, organised team sports, or music and dance lessons. I think that it is a slap in the face to all Canadians for this prime minister to force Canadian’s to work longer before they can retire, force hard-working, taxpaying Canadians to take work not in their field (seasonal workers) and claim no money when it comes to social programming, tuitions and the like, when the prime minister himself turns his working schedule into one big paid vacation. I think that this prime minister and his government have increasingly shown a distasteful sense of entitlement and privilege when it comes to governing Canada and it is hurting this country and its people. The lack of sitting time caused by his refusal to allow parliament to sit while he prorogues and writes his throne speech I am guessing will be the justification that he and his party use to ram through more omnibus bills and more time allocated debates. Canadians know that after every speech from the throne, his royal highness Steven Harper and his strong, stable majority conservative government force through their bills in the non-democratic fashion, that has become their way of doing things. If we can count on nothing else from Steven Harper we can count on him to cut and run when the going gets too tough, because this is Prime Minister Steven Harper’s modus operandi. Every time Steven Harper has to face the music for a failed policy, a scandal, or is called upon to answer tough questions he prorogues the government, and when he can’t do that he hides in his office avoiding the press and avoiding the House of Commons. This as Mulcair rightfully pointed out is a blatant attack on the democratic process and a deliberate attempt by Steven Harper to stop the opposition parties from doing their job effectively and yet another attempt at trying to avoid being transparent with Canadians. Asking to prorogue is one thing considering that it can be done while parliament is sitting, but to actually suspend the return of all parliamentarians when there is no need for it, in my opinion is all the proof that I need to prove that Prime Minister Steven Harper is as Mulcair put it, a bully and a coward; a control freak that loves to bask in the glory of his party’s successes, but refuses to be held accountable, or answer for their many failures. 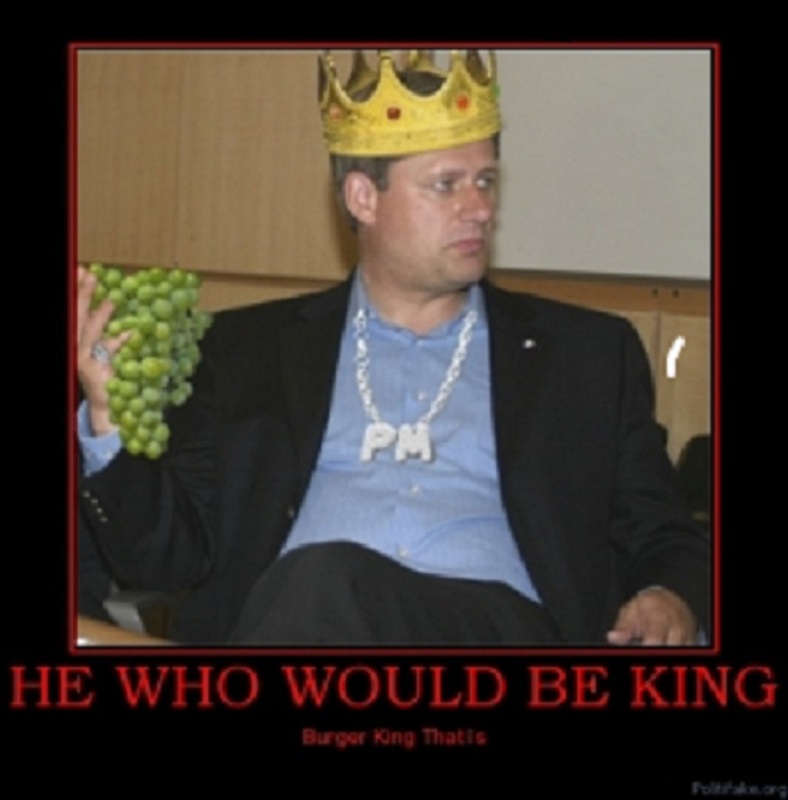 In 2008 Harper prorogued the government not once, but twice to avoid a non-confidence vote that would have toppled his minority government and quite frankly that means to do nothing but keep his power. In 2009 he prorogued again, halting House of Commons committee hearings into the treatment of Afghan detainees and killing a number of pieces of legislation. I have a problem with the fact that there are serious problems that need to be fixed and Steven Harper is taking yet another extended vacation on the tax payer dollars and forcing all of the other parliamentarians, support staff to do the same; to all remain away from their jobs with pay while he writes a speech from the throne? We have a transportation of dangerous goods by rail problem in Canada and a potential for many losses of life and irreversible damage to the environment as seen in Lac Megantic Quebec and it is now that Steven Harper decides to take an extended summer break to leisurely write a speech from the throne. Just to demonstrate how harmful, inconsiderate and out of touch with the real problems facing Canadians, this conservative prime minister is while he is writing his throne speech(wink, wink) and forcing the closure of parliament also is halting on what to do about the rail problem. there can be no debate, no recommendations and no emergency laws passed as long as the House of Commons does not convene; in short no decisions can be made to ensure that this type of catastrophe does no befall another town or city. Attack the person who pointed out the problem. Down play their scandal by pointing out that previous governments now in opposition were guilty of doing the same thing when they were in power. Sensor out so much information under the guise of national security grounds that they render said document useless as evidence. When all else fails they use prorogation. This government rose to power because Canadians were tired of scandal after scandal and big-headed government. The Conservative Party of Canada won 2 elections pointing out the fact that the Liberals had not heeded the Canadian people and had gotten to think that they were so powerful that they could break the law, disregard the will and needs of the people and do it all without suffering any political fall out. It was their main promise to Canadians to run an open, transparent and scandal free government and I submit that they have done everything but keep this promise. One only has to look at a few of the many lies that this leader and his party have told, to understand that this government could not tell the truth if the words were put in their mouth. Steven Harper said that he personally checked out Pamela Wallin‘s declared expenses and found them to be all right. It has become very clear that he either lied about checking out her expenses personally, or he lied about what he found were wrong doings in them. How could the Senate in which her party holds a majority find enough proof of questionable expenses to warrant the sending of the facts of her audit to the RCMP for further investigation, citing over $100,000 in expense irregularities over just 3 years and the Prime Minister of Canada looking at them personally find nothing even questionable? Toni Clements’s denial that he not only redirected $50,000,000 to his riding of Huntsville Ontario, intended for border safety improvements, but also that he created special paper work to avoid being caught in a government of Canada’s audit; later calling them legacy projects. It is easy why this prime minister who personally appointed these 2 senators during his bid to stack the senate and gain total control of both chambers of the government would not want to face the Canadian people or the opposition parties and answer questions. Keeping in mind that he has appointed senators of this ilk to an unelected chamber of government that he had promised to either rid Canadians the burden of, or totally reform it so that its members would have to be voted in and not for life. Senator Pamela Wallin‘s audit cost to the taxpayers of Canada along with the amount she falsely claimed comes to well over $100,000 and the whole senator Mike Duffy fiasco followed by the Nigel Wright check business is a disgrace. This government has played all Canadians for fools; whether you supported him or not he has broken every promise that really matters to all Canadians lets list some of them. This entry was posted in abuse, abuse of power, Canada, Government, Uncategorized and tagged Bev Oda, Canada, Canadian, Canadians, Conservative Party of Canada, First Nation, Government of Canada, heavy handed tactics, House of Commons, House of Commons of the United Kingdom, Kelowna Accord, Liberals, Pamela Wallin, politics, prodedure, Quebec, Stephen Harper, stepping up to the plate, Thomas Mulcair. Bookmark the permalink. I say let’s take a page out of the book of that other august Puritan, Oliver Cromwell and name Stephen Harper Lord Protector of Canada. Subsequent to that being established, HE can dissolve Parliament and decree that Parliament be convened every five years to rubber-stamp his polcies. Taking things a step further let’s change the name Canada to Harperland!!! I do not think that Steven Harper would take kindly to the demotion you are suggesting. What man would settle for the title of Lord Protector of Canada when he sees himself as king and has more power than one? As for your suggested new name for Canada (smile) I say, “A rose by any other name…..” Thank you for taking the time to comment. Have a great day!! !